Anyone else using Hornady SST's out there? I would like to compare notes on my recent kill. I am running them in my 7MM Rem Mag and was very surprised at the damage they did. I shot a 150# doe in the neck at 75 yards this season. She didn't just fall she flipped on her back legs strait up rigid for a second before she came to rest on her side. I have never seen a reaction quite like that before. Once I pulled the hide off I was amazed at the size of the hole the bullet made, I could stick my fist in the hole. I hit a lot of bone so there were fragments everywhere but no bullet fragments. It was a through shot so I did not recover the bullet. Neck shooting is my prefered shot (I'm lazy and don't like to chase critters LOL) and have killed many deer this way. Anyone else have any hits like this? I wonder what would happen on a shoulder shot. 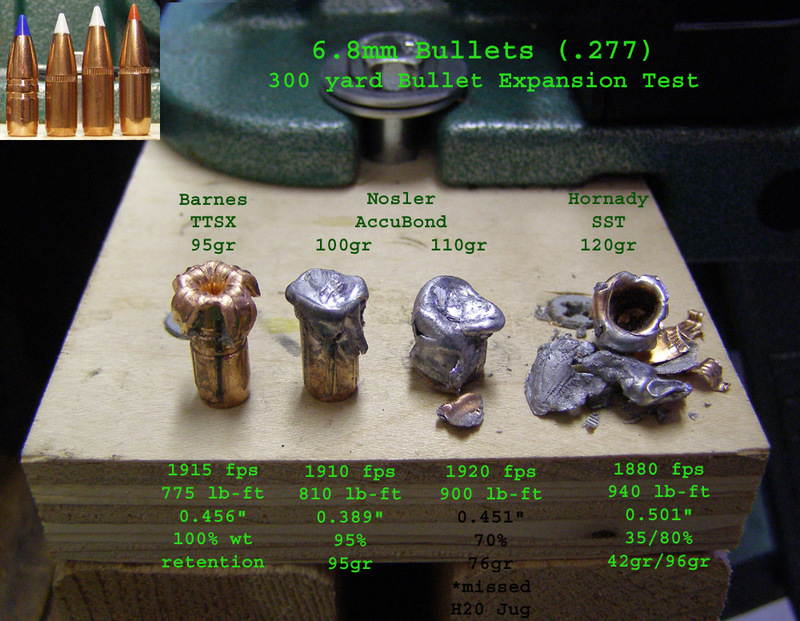 The only other bullet that I can remember doing this kind of damage was a Nosler we used many years ago. I can't remember the exact bullet but we called them a banana peel because of the way they expanded and the big holes they left. Anyone else using Hornady SST's out there? I would like to compare notes on my recent kill. I am running them in my 7MM Rem Mag and was very surprised at the damage they did. I've hunted successfully with the SST and believe it is the most lethal bullet there is for medium game. When I had my first chance to hunt with the 6.8, it was on a small piece of property and the owner didn't want to deal with any neighbors if a deer went on their land. The deer trails were only a few yards from his property line. I choose the SST. I shot two deer that night - a doe and a button buck at a distance of 200 yards. I engaged the doe with a broadside shot to the heart/lungs 12 yards from the property line. The other with a head-on shot in the center of the chest at 150 yards. Both only went 10 yards - shortest I've ever seen a yearling go. There were no typical exit wounds to speak of and no blood trails at all. When we field dressed them, the doe's heart was 1/2 missing and there was a hole I could put my fist through in the far-side ribcage but the hide contained all the fragments with no exit. The yearling's internal wounds indicated the bullet broke apart and went left and right. Four ribs in the right-side center of the ribcage were broken in a 1/4-inch line but no exit wound. When I think SST, I think "grenade". The terminal performance testing I’ve conducted has collaborated these hunting results with good fragmentation even at 300 yards (see results below). Even the 130gr SST shot from my 6.8 fragments like this. From all the SST's I have tested and recovered, here is how I believe this bullet operates. The polymer tip gets pushed back into the bullet on impact causing the copper jacket to flare out away from the unbonded lead core and start to tear off in pieces. The copper jacket continues to fold back on itself forming a "cup" while releasing the lead core which moves forward out of the copper jacket (the copper jackets have always been clean as a whistle inside). The lead core fragments and is distributed in multiple directions. I only use neck or lung shots with this bullet. I would avoid shoulder shots. Fragmentation bullets like this, e.g., Nosler BT, have a reputation for not penetrating shoulders. I’d be leery to use it on elk because I want more penetration. I use a Barnes or GMX in this situation. one of my concerns with the SSTs is lead fragmentaion that would contaminate meat. That is why shot placement is extra important for me when using the SST. I don't use SSTs in my .270 because it has enough power with with typical expansion bullets. In the 6.8mm SPCs and its lower velocities, however, its an impressive combination. My 18" ARP 6.8 and 120gr SSTs are achieving better than 1/2 MOA accuracy with a 2580 fps mv. I rely on Barnes 110gr TSXs if I want expansion and penetration without fragmentation. I"m begining to explore using the 130gr SST in my 6.8. The 123gr SST would be a good consideration for your upcoming Grendel build. I have already cornered the market on 123gr Amax bulits for the Grendel. I looked for bullet fragments outside of the nasty torn up blood shot meat but I did not find any. But I do trim anything off that even looks like it could be nasty. The rest is considered coyote bait and I actually prefer coyotes with lead poisoning, high speed that is. I've only shot one whitetail with an SST so far. 129 grain out of a .260 Rem. Shot was about 40 yards, broadside, just behind the shoulder. Tiny exit wound in the off side shoulder. I poured the contents of the chest cavity out, there wasn't anything recognizable as an organ left in there. He still ran about 40 yards before piling up. I shot my biggest mule deer to date with one of my 7mm RM handloads. It was the 139 gr. SST over RL-22...don't know the exact recipe right now. He was walking straight at me and I hit him right under the chin. He was slightly below me about 130 yards away. The bullet came out between his shoulder blades and cut the hair off his back to about 6" in front of his tail. He folded like a cheap tent. As far as lead fragmentation...you have it with any bullet that uses lead as a core. I am on the Kansas Wildlife and Parks Hunter Ed Advisory Committee, and was able to be privy to the study about lead poisoning the Big Game Biologists did regarding lead fragments in various critters. Even a .50 cal. solid round ball on a double lung shot in a deer left lead fragments. The lead left in the meat isn't enough to poison humans. What they are concerned about is mainly the raptors that eat the offal. The worst lead fragments were left in prairie dogs from high velocity lead hollowpoints. There are 2 theories to arguing with a woman...neither works. tbox, I didn't express my concern with lead fragmentation correctly. I'm more concerned with loss of meat prior to processing. I've seen too many elk brought in that were shot with a fragmentation bullet and the butcher would just cut off the far-side shoulder and toss it because it was blooded/peppered with fragments. The SST fragments more than bonded lead-core bullets. The only bullet I have found to fragmented more than the SST is the new Nosler Accubond Long Range which is not charactoristic of an Accubond. with that concern in mind...have you considered/tried some frontier "game ranger" type projectiles??? fmj with big flat point??? they are on the market over here now, havent heard of anyone using them here yet but the sales pitch is rather good. Elvis , thanks. I looked them up. They have no bullets smaller than. 308 and they really are a close range bullet. I use Barnes TSX or Hornady GMX when I want to preserve as much meat as possible. Generally I don't have problems with contamination because it is contained in the bloodshot portion of the meat. I however don't want to waste extra meat because the bullet I used acted like a frag grenade. This is the first deer I have shot with these bullets and was amazed at the damage although no excess meat was wasted. Like slim stated earlier I don't know that I would want to use these bullets for an elk size target. I've tried some SST's in my .257 Roberts, but could never get the accuracy that I wanted out of them. I found a sweet spot with my 6.8mm and 120gr SSTs when I got them close to the lands - 1/4 MOA. My dad uses SST's in a 6mm Remington for whitetail.....he loves them !!! They will definitely do some damage. From what we've seen they preform very similar to the Nosler B-Tips. I personally wouldn't be afraid to use them on larger game but I would use the heavier bullets designed with the bigger game in mind.